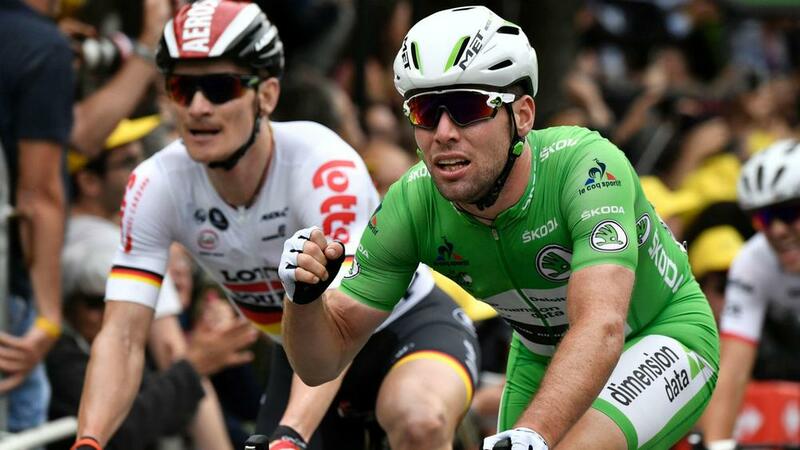 Mark Cavendish claimed his 28th stage win at the Tour de France, edging out Andreas Greipel in a dramatic sprint finish to the 223.5-kilometre race from Granville to Angers on Monday. Cavendish finished first in the opening stage and equalled Bernard Hinault's 28 wins in a photo finish, while Tinkoff's Peter Sagan retained the yellow jersey and holds an eight-second lead after finishing fourth. The 31-year-old Dimension Data rider sat within the peloton for much day, but pushed towards the front when leading duo Armindo Fonseca (Fortuneo – Vital Concepr) and Tommy Voeckler (Direct Energie) were caught. Lotto-Soudal's Andre Greipel led the sprint in the final metres, but Cavendish pulled out from behind and pipped the German to the line, meaning only Eddy Merckx has more stage wins at the Tour de France. Fonseca made a very early break and opened up a lead in excess of six minutes over the peloton after 75km, claiming one point in the King of the Mountains competition in the only category four climb at Villedieu-les-Poeles. The Frenchman did not seem fazed by spending much of the race on his own, leading it solo as the stage travelled through his home province of Brittany. Voeckler launched an individual chase with 87km remaining and the gap to Fonseca at five minutes and 27 seconds, but he took just 7km to catch his compatriot. The peloton soon upped its pace and closed in on the front pair, with Ettix-QuickStep, Lotto-Soudal and Tinkoff leading the charge. Fonseca passed through the intermediate sprint ahead of Voeckler to claim 20 points in the green jersey classification, but Cavendish took the outright lead after coming sixth. The gap was down to just 31 seconds with 30km remaining, but that increased to almost one minute on a gentle decline in the closing stages. However, the front two were swallowed up with eight kilometres remaining and the Dimension Data, Lotto-Soudal and Ettix-QuickStep teams were among those jostling for position into the closing kilometres. Greipel took charge of the sprint but Cavendish tucked in behind before picking his moment to launch a powerful attack on the finish line. Although the German lifted his arm in celebration, the Brit was declared winner after an anxious wait, with Bryan Coquard (Direct Energie) edging out general classification leader Sagan for third.